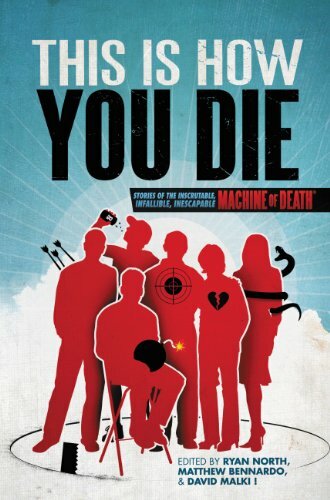 The anthology THIS IS HOW YOU DIE, sequel to THE MACHINE OF DEATH, was released today. I don’t have a story in it (I was considering submitting something, but I’m way too busy), but my friend and alpha reader Karen Stay Ahlstrom (who happens to be married to my assistant Peter Ahlstrom) does have a story in the volume. I was surprised when she submitted her story to our writing group, since she usually participates as a reader rather than a writer, but it was a great story and I think the anthology’s editors (Ryan North, David Malki!, and Matthew Bennardo) made a good choice when they plucked it from the field of over 2000 submissions for the volume. As I understand it, discussion got underway in the webcomics community about how cool the idea was: a machine that predicted your manner of death, but didn’t give you enough details for that knowledge to be very useful to you. DINOSAUR COMICS’ creator Ryan North and WONDERMARK creator David Malki! then got together with writer Matthew Bennardo and they edited the anthology THE MACHINE OF DEATH to explore the concept further. That book was indie-published and hit #1 on Amazon. THIS IS HOW YOU DIE is the sequel, and it was picked up by mainstream publisher Grand Central, an imprint of Hachette. I think the concept is a great one, and the first book is quite entertaining. If you’ve read the first volume and are wondering if you should read the second, you may have noticed that one issue with the first is that a number of the stories tread the same ground, making a few of them a bit repetitive. The second book breaks that mold—the editors specifically put out a call for stories that took the concept in new and interesting directions. I’ve read the second volume, and it certainly does that! A few of the stories do start out seeming like they’re going to be retreads and then you realize that something is wildly different. That’s the case with Karen’s story, titled “Machine of Death.” Each story in both anthologies has a title that is the cause of death read from the card the machine produces, such as “Natural Causes” and “Execution by Beheading,” but as in the comic above, these are often misleading. And that’s also the case with Karen’s story. What if you haven’t read the first volume? Don’t worry. These are both concept anthologies, not a coherent narrative. Each story stands on its own. 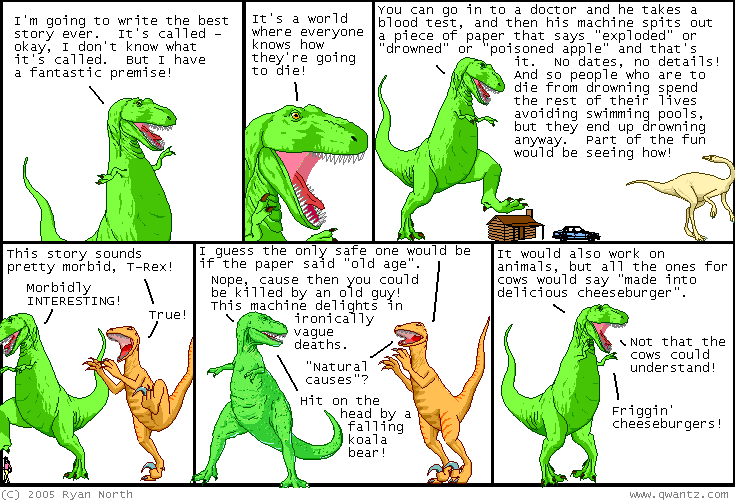 All you need to know is the initial concept of a machine that predicts how you die, and you’re good to go. The stories can be read in any order or no order. If you haven’t read the first volume, don’t hesitate to read the second one now and decide later whether you want to read the first one. These are the cream of the crop (though the first volume also has some very good stories—and it’s currently in the Humble Ebook Bundle II, which is a great deal). There’s also this trailer for the book (or basically just the concept). It’s a bit gory, if you want to avoid that kind of thing.